This module is part of Tuleap Enterprise. It might not be available on your installation of Tuleap. The Timetracking plugin of Tuleap aims at providing a simple and easy way to deal with artifact time tracking and time reporting for users. 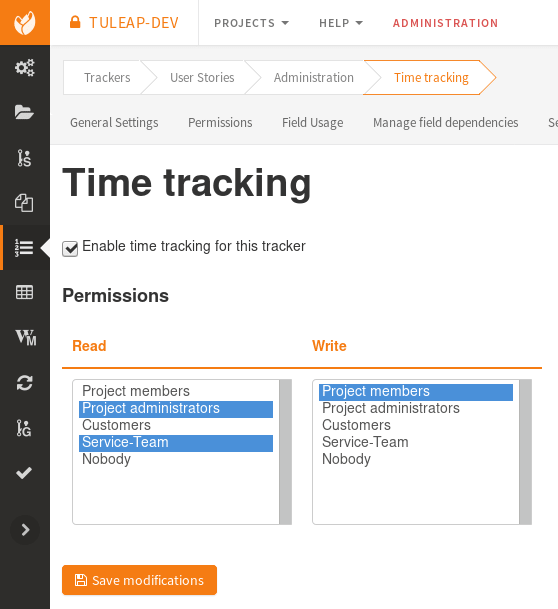 The time tracking feature must be enabled per tracker. Once activated, writers users will be able to add times per artifact. By default, a writer will only see their own times. Members of the readers user group can see an aggregated view of submitted times. Writers users will be able to add times per artifact in a dedicated tab in the artifact view. This table will contain all the times added and be displayed according to the permissions defined. Timetracking plugin also provides a user widget. This widget allows users to filter and display times added in the whole platform during the time period provided. By default, the search is done for the last week. If multiple times are added in the same artifact in this time period, the widget will only show one entry per artifact summing the total time for this period. Artifact’s data are displayed on the top of the modal. Artifact’s times of the given period are displayed on the table. It’s possible to add and edit times on this modal. This widget allows users to filter and display times added in the selected trackers in the time period provided. By default, the search is done for the last month. Times are grouped by trackers. You must be able to access a tracker to select it. The sum of selected trackers’ times is displayed.